Issue 1 features spectacular photography and photo essays, memoir excerpts, essays, and haiku. Read about rowing across an ocean, spearfishing in Greece, getting lost in the high Sierras, night-surfing in Australia, kayaking with Orcas, meeting elephants under the full moon in Africa, and more... This issue includes the Ridge to River Contest winners! 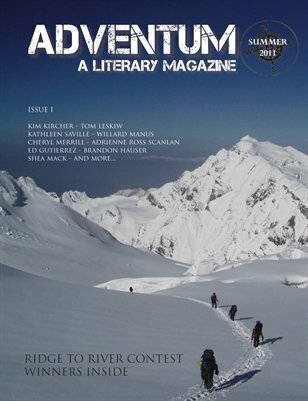 Visit www.adventummagazine.com to view the digital issue on your computer or android phone. This biannual digital/print magazine accepts creative nonfiction, essays, and memoir pieces that explore some aspect of personal experience in the outdoors. See www.adventummagazine.com for full guidelines and philosophy.